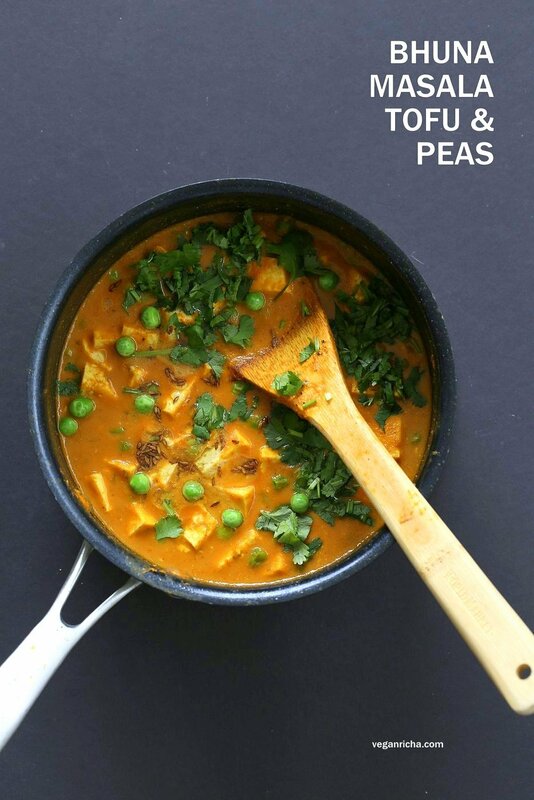 Tofu Matar Masala – Tofu Peas in Blender Masala Sauce. Curried Tofu and peas with a roasted cumin tempering. 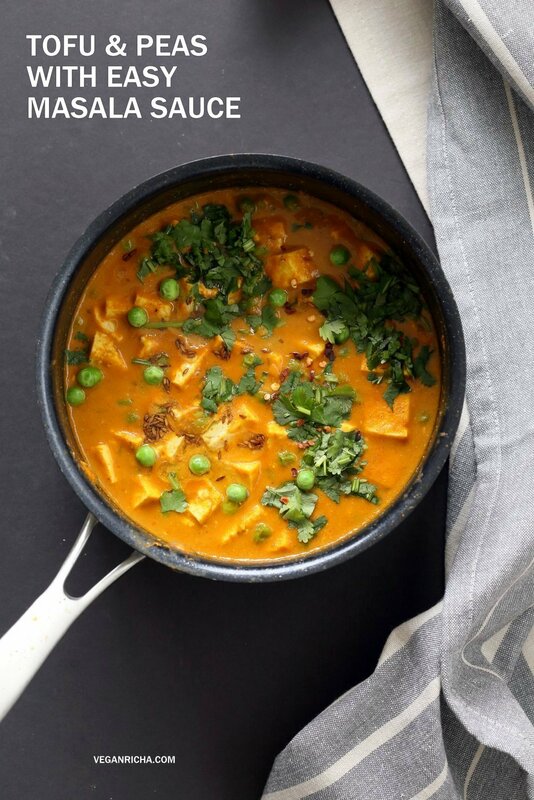 Vegan Matar Paneer. Gluten-free Recipe. Use chickpeas, beans or veggies to make soy-free. This easy Tofu Matar Masala Comes together within 15 minutes if you have some blender bhuna masala sauce ready to use in the fridge or the freezer. Blend up the sauce with non dairy milk or some cashews or other nuts and water, bring to a boil with tofu and peas, or use veggies of choice. Finish off the curry with a toasty oil tempered cumin seeds and cilantro. Easy and so delicious. No Masala sauce, no worries. Blend up the ingredients according to the masala sauce recipe and cook it for 20 to 25 mins, then use 4 tbsp of the sauce and proceed. Add fresh or crisped tofu, add veggies of choice or chickpeas or beans. Garnish with spices of choice. 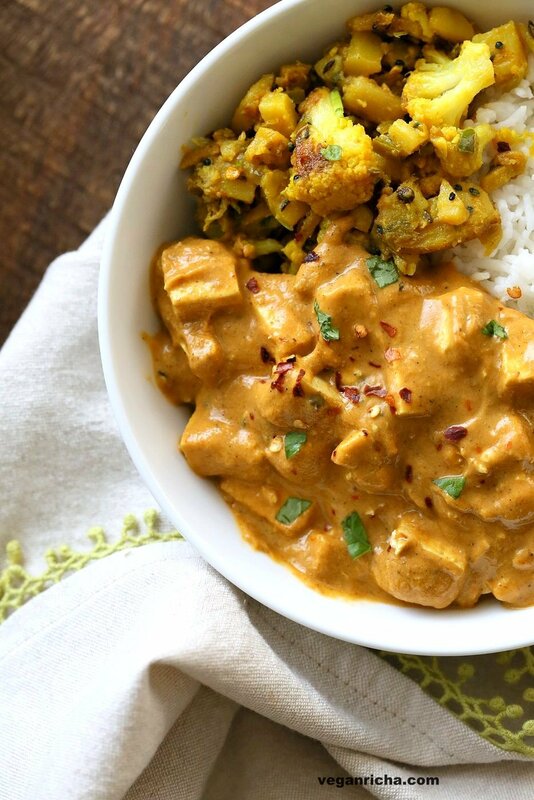 The toasty cumins seeds adds a burst of flavor to this tofu matar masala. Toast the cumin seeds until they are fragrant and change color for best results. 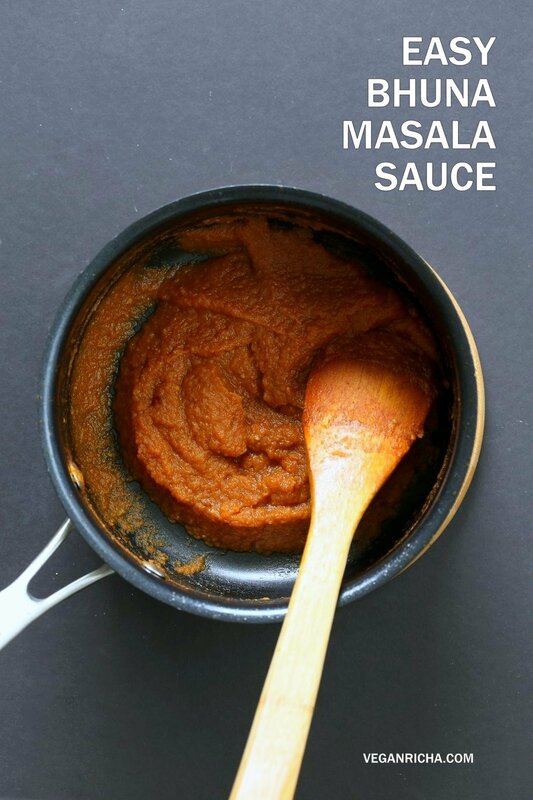 Use the easy Blender Masala Sauce. Blend and cook until well roasted. Blend the sauce with non dairy milk or thin cashew cream. Add to crisped tofu and peas. Simmer and serve. Creamier Tofu Masala version with cashew cream, served with aloo gobi. Tofu Matar Masala - Tofu Peas in Blender Masala Sauce. Curried Tofu and peas with a roasted cumin tempering. Vegan Matar Paneer. Gluten-free Recipe. Use chickpeas or veggies to make soy-free. 1 cups non dairy milk such as almond soy, coconut or cashew. Blend the bhuna masala sauce with non dairy milk until well combined and set aside. For a creamier sauce, add 4 tbsp soaked (for 10 mins) raw cashews or macadamia nuts to the blender and blend in. Heat oil in a skillet over medium heat. Add garam masala, turmeric, cayenne, fenugreek. Add tofu cubes and mix and cook for 2 minutes. Add the blended sauce, salt and sugar and bring to a good boil. Fold in the peas, Continue to simmer for another 5 to 10 minutes to develop flavor. Taste and adjust salt and spice. Make the tempering: Heat oil in a small skillet over medium heat. When hot, add cumin seeds and toast them until they get fragrant. Drizzle this over the hot tofu matar masala just before serving. Garnish with cilantro. Serve with rice, flatbreads or in a bowl. Follow Steps 1 to 3 above. Add oil to the IP in saute mode. Add pressed cubed tofu, spices and cook for 2 to 3 mins. Add the blended sauce, salt, sugar and peas and pressure cook Manual 5 mins in the Instant Pot. Quick release, garnish with the tempering and serve. To make this Oil-free: Toss the Tofu in spices and bake at 400 degrees F for 15 to 20 mins. Add to the blended sauce and continue. Toast the cumin seeds over a dry skillet until fragrant. Crush slightly and garnish the curry before serving. To make this Soy-free: Use any veggies such as caulifower, carrots, green beans, or beans such as chickpeas, split peas. Hi, I love the recipe, I have just made this with tofu and I’m wondering will the leftovers freeze well? Thanks! they should freeze fine. You want to put them in a container with the least amount of extra air space or place a wrap over to seal to reduce freezer burn. This looks so good – and quick to make! Can’t wait to try it with your Bhuna Masala recipe! Too many spices used for cooking, do they too heat to the body? I have problem for digesting bean or legumes? I like to eat beans. How can I solve it? Spices like cumin, coriander, fennel help to digest beans better. Spices are not hot, they just add flavor. Hot ingredients such as cayenne, chile, black pepper will add heat to the dish. The hot ingredients are likely to also heat up the body. to make it easy to digest lentils and beans, soak them for an hour, throw the water and then cook them. For very gassy beans, you want to boil the dried beans in water for 5 mins, then discard that water and cook in a pressure cooker or saucepan until tender and use within the day. Hope this helps. I really like Indian foods. Since I used more spices to my dishes, I never like outside’s foods and cooking 3 meals daily. Are u seldom taking fruit? No more menu using fruits I found. I am very weak and too thin. How can I improve? Any herbs can use for building stronger? I can buy Indian foods in Hong Kong. I eat fruit as a fruit, for snack or a part of breakfast. I dont really add fruit to meals, which is why they dont feature on meal recipes. Eating a balanced diet full of veggies, beans, whole grains, nuts and eating more should help with the weakness. You should also check with your doctor to rule out other issues that might be causing weakness. This was a fantastic recipe: my best try so far – vegan or not. Easy, fast and delicious. I made the bhuna masala and almond milk ahead of time, and added soaked cashews, as recommended. The tofu texture was just like paneer’s. I could have been fooled, I think. The only things I’ll change next time: I shall double the recipe, but keep the tofu the same, and put in way more peas. Thanks for the inspiration! Made this for Dinner tonight! Added some veggies too. So good! This looks lovely! Can’t wait to give it a try ???? I made this today and it was amazing. I added the optional soaked cashews and used coconut milk, both which gave it a very rich and creamy consistency. The bhuna masala sauce took almost an hour on the stovetop before it turned into a paste, but it was worth the wait. Awesome! yes the masala takes a while. I usually make that over the weekend to use it for a weeknight quick curry. OMG Richa. That is so good with the bhuna masala sauce. I was trying to resist eating the whole dish myself. I pretty much make whatever you post on Facebook and supplement with your book. I’m liking the videos too. I LOVE tofu masala, but the ones served at my local Indian restaurants are usually not vegan! This is such a wonderful recipe! I have to try making this soon! This was so good! I used spinach instead of peas, and it tasted amazing! I LOVE this! I made both the bhuna masala sauce and this recipe for the first time today. I’ve been intimidated by Indian recipes for a long time, but now I know I’ll be trying more. I didn’t have any fenugreek leaves so I didn’t use them, and I left out the cashews for a lower fat version. I used almond milk. The sauce was a little thin, so I might use some cornstarch or something next time, but the flavor was great! Absolutely delicious. Sauce was amazing and quick to make. Even without the cashews it was nice and creamy. We also added chickpeas to bulk the curry up alongside the tofu and extra peas of course. Made our own chapatti to soak up alk the delicious sauce. Love this dish! I’ve made it heaps of times now with occasional variations on the veggies depending on what I have on hand. It’s been a hit with friends and family. Love this so I keep sauce in the freezer now for busy evenings. Really recommend it to anyone thinking about making it! Made this last night for dinner. The Bhuna Masala paste turned out well. Next time I think I’ll try the second cooking option for the paste which might develop the flavour a bit more. The curry was delicious with tofu and peas and I bet it would be great with a variety of different veggies. Made your cumin scented rice from your cookbook to go with it. Yum! Thanks for the recipe. Awesome! yes definitely. The onions take a long time to caramelize so cooking them separately makes it faster and you get more caramelization. With tomatoes, the flavor develops with slow long cooking which reduces the mix a lot and we can tend to switch it off before it is nicely caramelized. With just the onions, its easier to note the caramelization, so use whichever works best for you! I made this today, I am very familiar with Indian Cuisine and have worked in several restaurants in several restaurants as a chef. I was excited to try this recipe but disappointed by the results. I have a method of making tofu indistinguishable from paneer so I was skeptical to try this. I should have use my method because this turned out far too soft. Although there are different types of Panera so this may just be a personal preference for me. I was extremely excited about the sauce and I think where I went wrong is that I use soy milk and I should have used almond or cashew. I will try making this again next week using cashew milk and hopefully I will get better results. 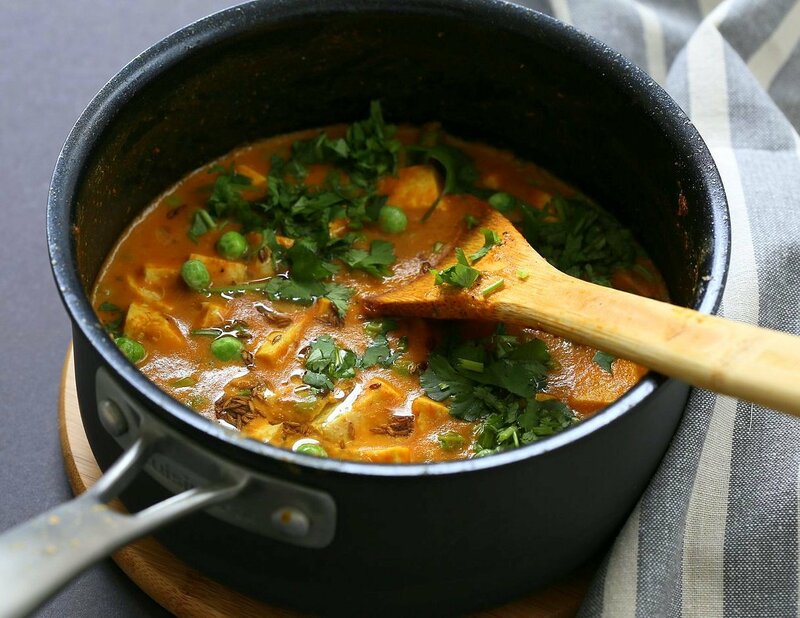 This recipe is more a tofu masala and a quicker version. To convert tofu to more of a paneer texture adds a bit more steps and time like linked above. It also depends on the brand of the tofu, some firm or extra firm tofu has much better texture(or firmer texture) that is already closer to paneer while some tofu brands are softer, hence need additional work. Paneer also does differ based on preference. So it depends on how you want the tofu to be and accordingly change it up. Press it for longer for a firmer texture. What do you do to your tofu? Dear Richa, I tried this recipe today, it turned out very good and tasted perfect! I used Macadamias for the milk and mixed also the nut puree in the cream which made the sauce very creamy. I took curcuma tofu which I can get here (in Germany) in organic quality and even with soy beans from Europe. I didn’ t know about the tempering before but it really gave the meal a good additional flavor. I will freeze the rest of tge bhuna massala as you recommended.